I love taking leftovers and giving them a makeover for their second appearance at the dinner table. Potato pancakes are one of my favorite ways to use up leftover mashed potatoes. 1. Mix the tablespoon of flour into your mashed potatoes to help stiffen them a bit. If yours are really mushy, you may need to add a little more flour. 2. Heat a sauté pan to medium high heat and add a light layer of oil. I just give a turn or so around the pan. 3. 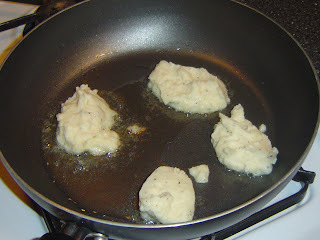 Drop heaping tablespoons of mashed potatoes into the pan and let cook for about 2 minutes or until they start to brown. I used a medium sized pan and only did 4 at a time. 4. Flip over (carefully) and turn heat down to medium low. 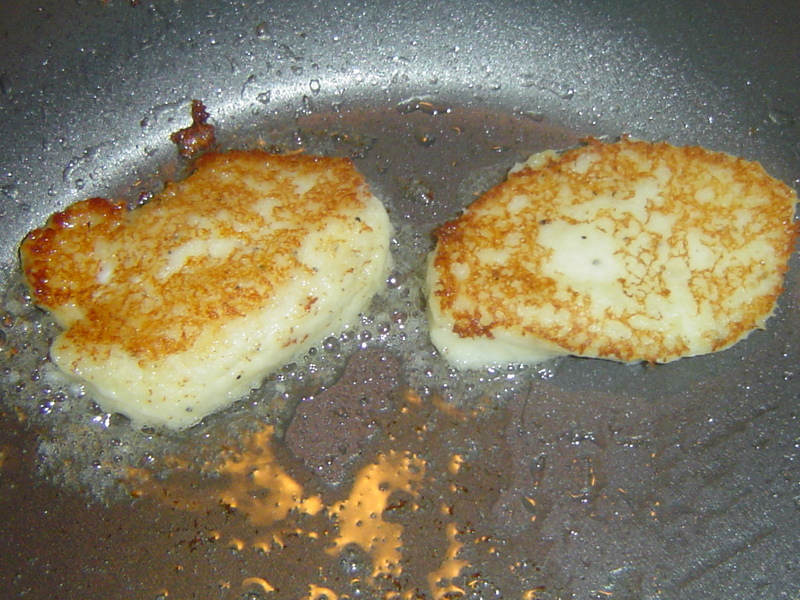 Cook for 4-5 minutes until second side is browned. 5. Repeats steps 2-4 until out of potatoes. 1. Combine sour cream, Dijon, and dill in a small bowl. Stir to combine. Allow to sit for a few minutes before serving. Thoughts: These are like tater tots on steroids. A nice crispy crust with a soft mashed potato pillow in the center. Yum! 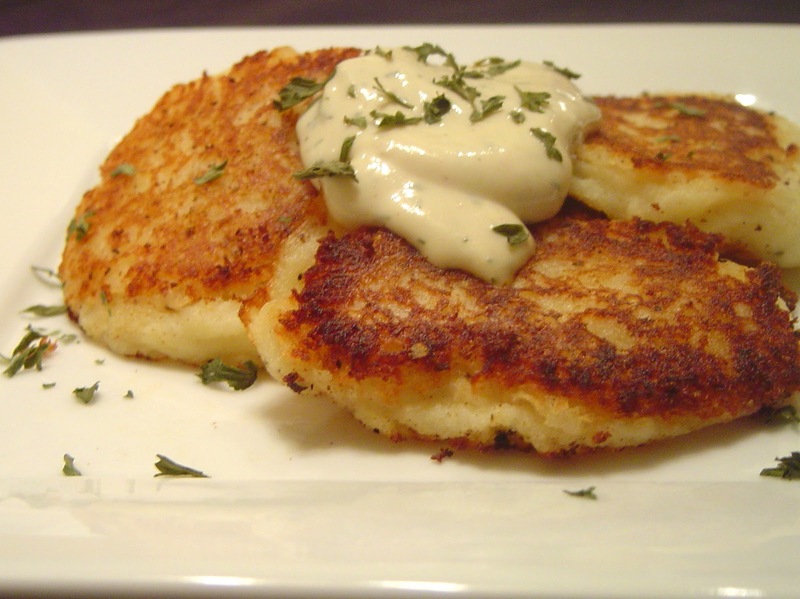 The mustard dill sour cream goes lovely with these pancakes and adds a nice zing to them. 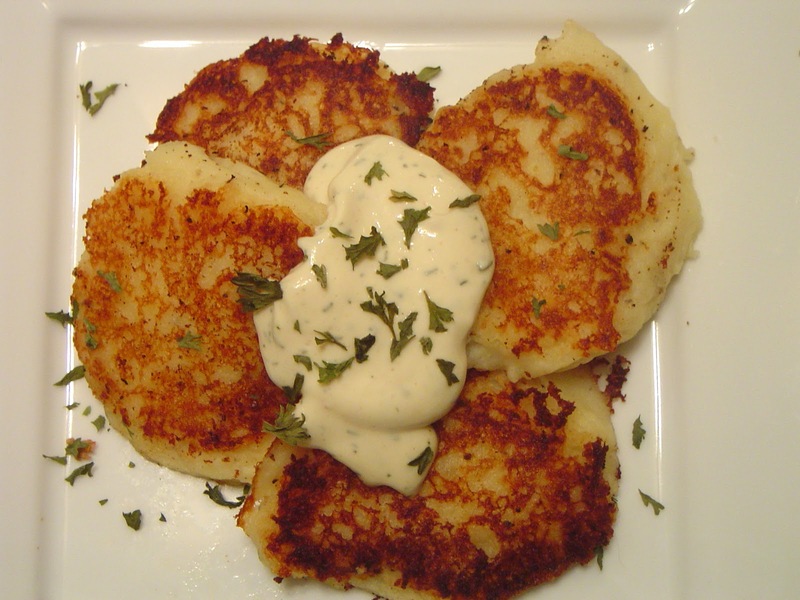 You can use this method for any amount of potato; just make sure they aren’t “just made”. They need to sit in the fridge for at least a day and I probably wouldn’t recommend using instant potatoes for this. I will also make these for breakfast sometimes and they would be a great morning-after-Turkey-day treat! Mmm this sounds really good! I love all these things - potato pancakes, mustard and dill. Tater tots on steriods?! I'm sold! I've never known what to do with leftover mashed potatoes, so thanks for this great suggestion. I especially like the sauce too. They look really delicious, yummmm! I grew up eating these. But you simply must add some finely chopped onion!! My mom makes these but instead of dijon sauce she just serves with a green onion and sliced tomato. So good.